What causes autumn leaves to fall? How do humans develop fingers? The answers to these questions and many of life’s mysteries lie in programmed cell death (PCD), the process by which cells purposefully die. PCD destroys cells in tree leaves when they are no longer useful and kills cells in fetal hands to separate fingers. Essentially, PCD kills certain cells so the rest of an organism can thrive. 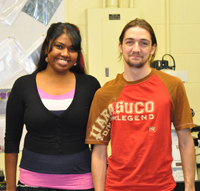 Recently, Dalhousie Biology Professor Arunika Gunawardena and a team of Dalhousie students (Christina Lord, Adrian Dauphinee and Jaime Wertman) became the first scientists to observe the order of cellular events that occur as part of lace plant PCD, and the first to determine the time course for it. Understanding this process — the manner by which the lace plant purposefully creates holes in its leaves — is among the first steps in being able to regulate cell death in plants. This could have huge implications in advanced cell biology research, agriculture and medicine. It took PhD student Adrian Dauphinee 72 long hours to observe PCD in the lace plant from start to finish. Armed with a custom-built homemade slide, a Nikon 90i research microscope and a lace plant specimen, Adrian spent several days in the Gunawardena lab. He meticulously adjusted the microscope as needed, leaving it for no longer than an hour at any point. PhD student Christina Lord explains that Dauphinee needed to “babysit” the slide because the microscope didn’t maintain its focal plane over a long period of time. “The initial focus system was not adequate for work this sensitive, resulting in dozens of hours of filming for few publishable results,” she says. The 72-hour process revealed a predictable pattern of PCD in lace plants, which you can watch unfold with a video posted to the Gunawardena lab website. The death starts in the cell’s centre and moves outward. Interestingly, the outermost layers are spared from death. This discovery inspires new questions about why some cells die while others don’t. While she is excited about her research’s potential medical applications, Dr. Gunawardena notes that there is much work to be done before confidently relating findings in lace plant cells to animal cells. Dauphinee is planning his PhD research to build on the recent findings. He hopes to insert foreign genes into the lace plant and observe their effects on the PCD process. It’s fair to say that PCD research has come a long way since Dr. Gunawardena revived lace plant research in 2002. Before that, the most recent research was a nearly 100-year-old PhD thesis written in French. Co-author Jaime Wertman explains why many of Dr. Gunawardena’s students have found studying lace plant PCD so fascinating. Despite the many accomplishments stemming from this project, Dr. Gunawardena credits her students’ teamwork as her biggest source of pride. 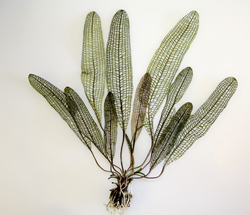 Read more about the group’s article, "The pathway of cell dismantling during programmed cell death in lace plant (Aponogeton madagascariensis) leaves," on Science Daily.